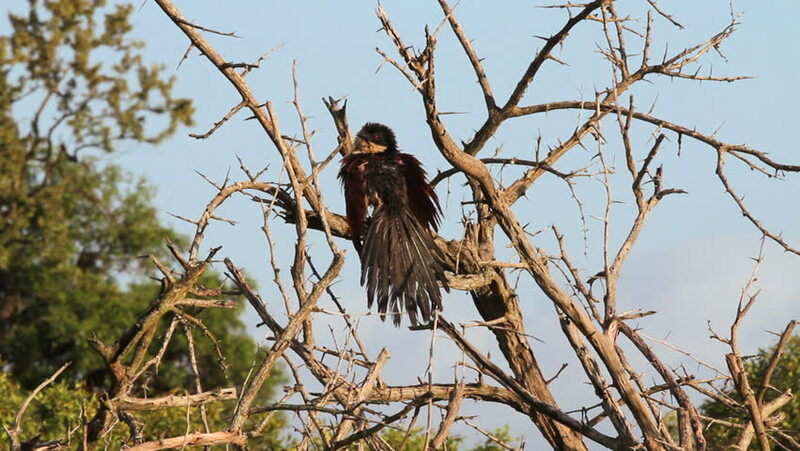 A Burchell's Coucal, dries its wings on the branches of an Acacia tree in the African sun. Filmed in the Kruger National Park. hd00:18Zoom out of Verreauxs Eagle perched on top of a tree to show habitat and landscape. 4k00:33Iridescent male Of Common Grackle ((Quiscalus quiscula)) in the NYC Central Park. hd00:22Verreauxs Eagle perched on top of tree branches in a savannah of the Serengeti. hd00:21Frigate bird with red breast on Galapagos Islands. . Amazing beautiful inhabitant of Ecuador with long beak. Bright colorful video closeup. 4k00:18GALAPAGOS ISLANDS, ECUADOR - CIRCA 2010s - A Galapagos hawk sits in a tree hunting for prey.